The wonders of a concealed, yet critically important world that resides on our doorsteps and the wider countryside are explored within Countryfile’s 30th Anniversary Garden, which also explores the experiences and journeys of those who live, work or even simply visit the diverse British Isles. 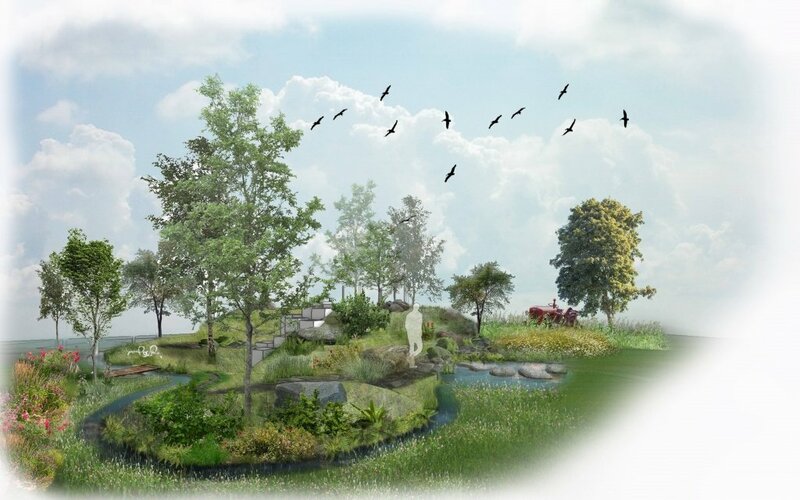 The tiered landscape represents different areas of the British Isles, from the Scottish Highlands, Yorkshire dales and moors to woodlands in North Wales, coastal areas, the streams, rivers and coast of the south and Ireland. Each area has its own characteristics with unique stone, plant and wildlife habitat. For the Scottish Highlands, there will be Gabbro boulders, Scot’s pine, Vaccinium myrtillus (blaeberry), Calluna vulgaris and Ligusticum scoticum (Scot’s lovage). The dales and moors will be bright with an abundance of Crataegus (hawthorn), and rock rose Helianthemum nummularium and wild thyme. Weathered limestone will feature here. In North Wales, woodland trees such as Fagus sylvatica, our native beech, will feature alongside slate outcrops and along the coast Crambe maritima will nestle alongside Crithmum maritimum and Glaucium flavum.